A tall, long armed defensive end prospect with an athletic looking frame, good girth through his mid-section and has the size to get even bigger. Displays natural flexibility to keep his base down and sit into his stance. At times will uncoil at the waist and not eat much grass initially off the ball vs. the run game. However, when he does get off the ball on time, he always extends his long arms well, can gain initial leverage and anchor on contact. Uses his length well to control blocks, is a coordinated kid through contact who maintains balance and exhibits violent hands. Can stack and shed on the outside, will fiercely rip off blocks and has the range in pursuit to make plays off his frame. Is also very disciplined playing on the backside. Locates the football well, closes the back door from the backside and doesn’t get caught taking himself out of plays. Plays his outside contain with good integrity. Possesses a good initial burst off the edge and has the ability to consistently threaten the corner. Likes to get to the edge and work through contact. Extends his long arms well and did a better job at the end of the year dropping his pad level into contact and incorporating his outside club in order to slip blocks and close around the corner. However, despite being sudden to slip, has a tendency to get upright and take away from his power/balance when trying to close. Likes to work the initial outside shimmy and break off a hard inside move and try to threaten the C-gap at times. When he gains a step, he has the ability to fight his way upfield despite his higher pad level.Did a much better job as a senior dropping his pad level and dipping under tackles when trying to reach the corner, which really opened up his pass rushing arsenal in 2011. Impression: Has a lot of untapped talent. And is the kind of athlete you would expect to mature into a solid three down player in the NFL as a 43 DE. Pass Rush: Andre Branch is a long-limbed, linear athlete. He can eat up space quickly and uses his length to fend off tackles and bring down the QB. If he gets a step on the blocker, it’s pretty much over. He a straight line guy that runs well. Very good with his hands and excels turning outside speed into inside power. He plays a little high, although he worked on this from 2010 to 2011. He can get upright through contact and lose power and balance. He’s not overly powerful and could stand to add at least 10 more pounds to his frame. Against the run: Branch anchors surprisingly well for a taller athlete. Branch plays the run as he’s surging up field to the quarterback. He’s got excellent eyes and good instincts. He uses his arm length and active hands to stack and shed. He has violent hands and uses his long frame to control blocks through contact. High football IQ as he rarely is caught giving outside contain. He will need to work on not popping upright on the snap. Branch, as a run defender, may be able to set himself apart from other DE’s in this draft. I was more impressed than I thought I would be. Athleticism/Strength: Branch is a long limbed, linear athlete that is a little tight in the hips. I think he’s a better fit in the 4-3 due to concerns of him moving laterally on his feet. He’s not an overly strong guy but he makes up for it with solid technique. He could stand to add some weight to his frame to hold up better at the point of attack. Bottom Line: Andre Branch may wind up the top DE in this draft class. He has the tools to be an elite overall player. He doesn’t have the get off of the elite speed rushers but he is a true three down player. If I were doing the drafting I wouldn’t have a problem taking this guy in the mid-first. Clemson has produced a lot of good defensive linemen over the years and I think Branch has the opportunity to be the best of the bunch. 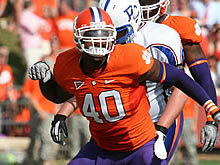 After redshirting in 2007, Branch played in seven contests in 2008, where he totaled 11 tackles. As a sophomore in 2009, Branch again did not start a game amidst the shadow of Da’Quan Bowers. However, as a junior he played in all 14 games and recorded 46 tackles (eight for loss). Now in a full-time starting role, the Richmond, VA native has blossomed into an elite pass-rusher. In nine outings (all starts) for 8-1 Clemson, Branch is first on the team in solo tackles (47), tackles for loss (12.5) and sacks (8.5). Branch has great size at 6’5” and 260 pounds, although he does have room to add some bulk to that frame. He runs in the 4.7 range of the 40-yard dash and has been clocked as fast as 4.65 from that distance. He has the agility to be a rush linebacker in a 3-4 defense at the next level and the size to be an end in a 4-3 scheme. He can get his hands up and knock down balls at the line or drop back and break up passes. Branch had the physical tools to go pro after last year, but a made a smart decision to return to the Tigers. He should continue to improve his pass-rushing moves, aggressiveness, and first step off the ball. As it stands, Branch should be no worse than a third-round pick in the 2012 draft. Andre Branch is a tall defensive end prospect. Athletic. Uses his hands well. Has some explosion. Quick around the edge. Probably needs to bulk up a bit and play with more consistency. Had a great senior year. Being looked at as a 34 outside linebacker, so has some versatility. Good player, who is not elite in any area, but gets the job done. Late first, early 2nd. Do the Giants need another pass rusher? No, but they’re going to draft one. If they decide that there isn’t a tight end, or corner, or offensive tackle worth taking at 32, then why not Andre Branch? He has all the talent, and can be brought along slowly. Adding Branch would make the pass rush even better. Use him at first on passing downs, and then in his 2nd year, take off the leash. It worked with JPP. Branch is a luxury pick, but has upside, and would be, at that position, the best player available. Believe it or not I do think the Giants need another pass rusher. It seems like they made a decision to live and die with the pass rush from their line. So that means you must replenish this to be successful. Grooming another stud on the line to take Tuck and Osi’s place is a no brainer. It’s all about who is there at 32 and what value the player has. If it’s a DE then so be it, it’s not about BPA as much as the value of the player which is more like an equation. We’ll always need pass rushers and that’s what we need to keep drafting them. The FA market for those guys is crazy, so chances are that if you draft a stud at the position, you won’t be able to retain him after 4 years … especially if you have a once in a 20 years talent along the line who’s gonna command a huge deal.